Since 2016, the BBT Infocenter in Steinach am Brenner has offered an overview of one of the largest infrastructure projects in the world. About three years ago, the TUNNEL WORLD exhibition on the Brenner Base Tunnel opened in Steinach am Brenner. On Friday, January 12th, the Infocenter welcomed its 50,000th visitor. 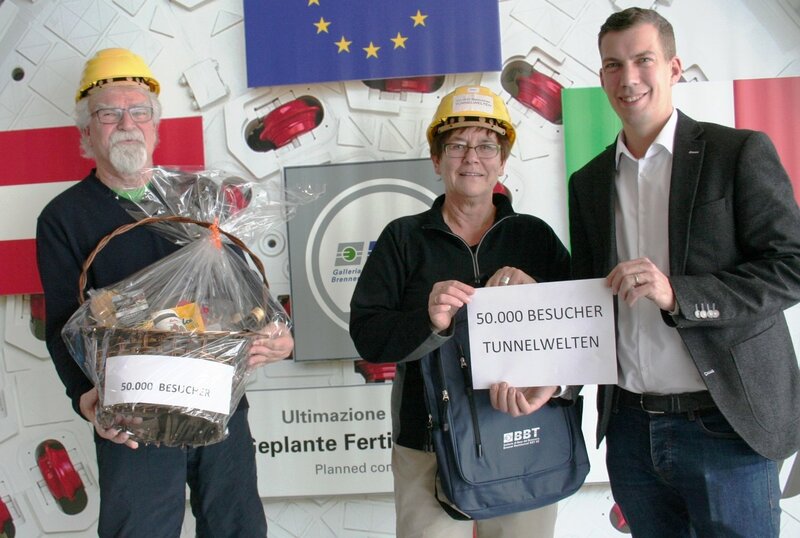 Martin Schneider, director of Tunnel World, greeted Sabine and Wolfgang Arndt from Rostock and presented them with a gift basket and a BBT rucksack filled with interesting gadgets (books on tunnel construction, DVDs and hard hats with the inscription "50,000th visitor"). The German couple also got a special tour of Tunnel World and a voucher for an exclusive tour of the Brenner Base Tunnel. The Arndts were delighted at being honoured and won't soon forget their visit to Tunnel World: "We love Tyrol and like to vacation in the Wipp valley. The Brenner Base Tunnel is well known in northern Germany as well and we wanted to find out more about the project of the century." Before retiring, both had worked in the construction industry. Sabine Arndt was construction director in a fertilizer factory, whereas Wolfgang was construction director in a demolitions company. BBT SE CEO Prof. Konrad Bergmeister was also delighted at the large number of visitors since the BBT Infocenter has opened: "These people come to find out more about the project, and they leave as ambassadors for a sustainable railway corridor, full of enthusiasm!" Tunnel World has two floors, about 800 sqm of exhibition space and includes a display tunnel plus numerous interactive pieces that invite visitors to get hands-on with the project. For visitors with a more technical bent, there is a special area. Videos show the individual phases of the progress of the works. The main point of the Infocenter is to show visitors the complex topic of tunnel construction from many different sides. The list of visitors is quite varied: Technical experts, people from neighbouring areas, students, tourists, schools and families are all interested in the construction of what will become the longest railway tunnel in the world. The Infocenter is right in front of the Bergeralm cable car valley station. Entrance is free of charge. Tunnel World is open from Tuesday to Sunday from 10 Am to 5 Pm.